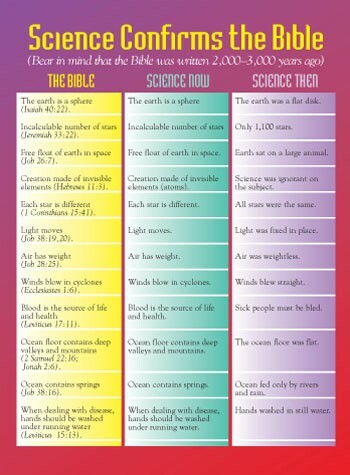 This tract shows how science has finally caught up to what the Bible has been saying for thousands of years. (Isaiah 40:22). The earth is a sphere The earth was a flat disk. (Jeremiah 33:22). Incalculable number of stars Only 1,100 stars. (Job 26:7). Free float of earth in space. Earth sat on a large animal. (1 Corinthians 15:41). Each star is different. All stars were the same. (Job 38:19,20). Light moves. Light was fixed in place. (Job 28:25). Air has weight. Air was weightless. (Ecclesiastes 1:6). Winds blow in cyclones. Winds blew straight. and health. Sick people must be bled. valleys and mountains. The ocean floor was flat. under running water. Hands washed in still water. 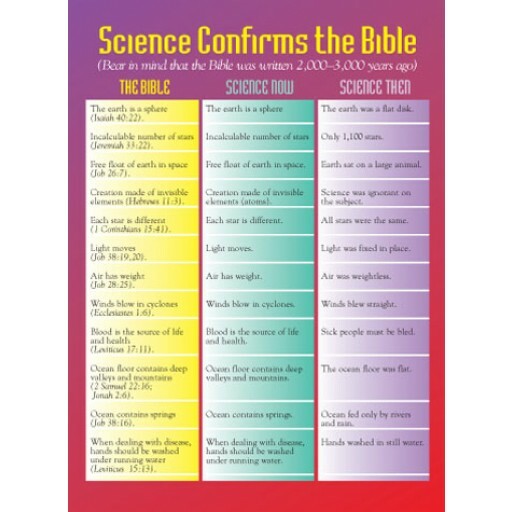 The Bible is supernatural in origin. Therefore take heed to its promise of Heaven and warning of Hell. 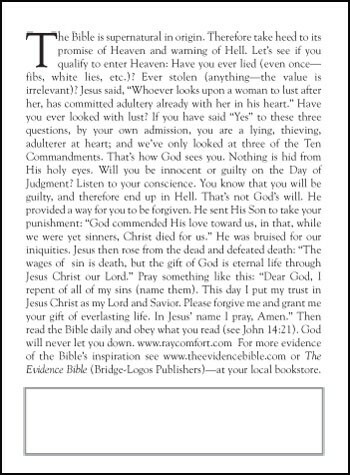 Let’s see if you qualify to enter Heaven: Have you ever lied (even once - fibs, white lies, etc.)? Ever stolen (anything - the value is irrelevant)? Jesus said, "Whoever looks upon a woman to lust after her, has committed adultery already with her in his heart." Have you ever looked with lust? If you have said "Yes" to these three questions, by your own admission, you are a lying, thieving, adulterer at heart; and we’ve only looked at three of the Ten Commandments. That’s how God sees you. Nothing is hid from His holy eyes. Will you be innocent or guilty on the Day of Judgment? Listen to your conscience. You know that you will be guilty, and therefore end up in Hell. That’s not God’s will. He provided a way for you to be forgiven. He sent His Son to take your punishment: "God commended His love toward us, in that, while we were yet sinners, Christ died for us." He was bruised for our iniquities. Jesus then rose from the dead and defeated death: "The wages of sin is death, but the gift of God is eternal life through Jesus Christ our Lord." Pray something like this: "Dear God, I repent of all of my sins (name them). This day I put my trust in Jesus Christ as my Lord and Savior. Please forgive me and grant me your gift of everlasting life. In Jesus' name I pray, Amen." Then read the Bible daily and obey what you read (see John 14:21). God will never let you down. 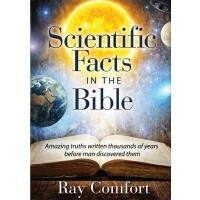 www.livingwaters.com For more evidence of the Bible’s inspiration see www.evidencebible.com or The Evidence Bible (Bridge-Logos Publishers) - at your local bookstore.